The designations employed and the presentation of material in this publication do notimply the expression of any opinion whatsoever on the part of the Food and Agriculture Organization of the United Nations concerning the legal status of any country, territory, city or area or of its authorities, or concerning the delimitation of its frontiers or boundaries. All rights reserved. No part of this publication may be reproduced stored in a retrieval system, or transmitted in any form or by any means, electronic, mechanical, photocopying or otherwise, without the prior permission of the copyright owner. Applications for such permission, with a statement of the purpose and extent of the reproduction, should be addressed to the Director, Publications Division, Food and Agriculture Organization of the United Nations, Viale delle Terme di Caracalla, 00100 Rome, Italy. 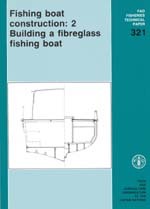 This document has been prepared on the basis of the author's practical experience of FRP boatbuilding in North America, Europe and the Developing World. It is the second Technical Paper within the series dealing with Fishing Boat Construction destined for fisheries officers and selected boatbuilders who want to develop their knowledge of various boatbuilding methods. Fishing Boat Construction: 2. Building a fibreglass fishing boat. The contents are intended to give the reader a sound basic knowledge of FRP and it's possibilities and limitations in boatbuilding. Any person using the document is likely to have some technical or management capacity upon which to base the information. It is not intended to describe all aspects of FRP, but attempts to cover most subjects applicable to small vessel construction and setting up a new boatyard. The publication leads up to and deals mainly with the single skin manual layup technique, however, other FRP technologies are also presented. Sections such as Design and Construction Considerations, Planning for Construction and the Production Flow Chart are intended to stimulate appraisal of the requirements of FRP boatbuilding while others such as Workshop, Equipment and Tools and Basic Vessel Construction offer practical guidelines.